It may not be warm yet in Lincoln NE area, but warmer spring temperatures will be here before you know it. Now is the time to get your HVAC system ready for warm weather. Getting a head start on maintenance and HVAC repair can help ensure that your home will stay comfortable when the warm weather arrives. 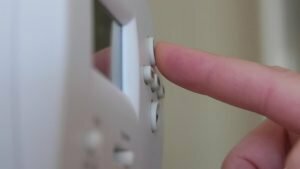 Your air conditioner may have been working well when you last turned it off last year, but a lot of time has passed since then. That’s why we suggest giving your AC a test run before hot weather is here. But before you start your test run there are a few things you should check first. We suggest waiting until outdoor temperatures reach 60-65+ degrees to test your air conditioner, here in Lincoln that typically means around April. When the time comes, first check the outdoor unit (called the air conditioner condenser) for any debris such as sticks or leaves in the condenser or fan. If you cover your air conditioner during the heating season you’ll need to remove the cover before you run your AC. For those that utilize a cover of any kind we advise to pull or turn off the disconnect to ensure the air conditioning unit cannot be run before going outside to see the cover is still on. Once a quick check of the outside unit has been done turn the thermostat to cool and lower the set point if needed to get the air conditioning to turn on full blast. As the air conditioner runs, walk from one room to the next and check each vent. Move furniture to ensure that each vent is unobstructed. Listen for strange sounds. Smell the air for odd odors that might be coming out of the vents. Once you’ve ensured that the unit is functioning well inside the house, walk back outside and check the condenser while it’s running. Listen for strange noises and check the unit for corrosion, rust, and other problems. While near the condenser check for additional obstructions like bushes that need to be trimmed. Although some homeowners like to hide their air conditioner by planting bushes and shrubs nearby, they can hinder the airflow of the unit if over grown. Bushes and shrubs can also cause the accumulation of other debris like leaves to form around the outside of your condenser through the course of a winter. To make your air conditioner’s job easier, clean up the area around your condenser. The air filter is the part of the HVAC system that cleans the air that flows through your vents. This is important because dust, dander, and debris can not only build up in your vents, but can clog your indoor coil and reduce the efficiency of your HVAC system. After using your furnace all winter long, your air filter will need to be replaced. Replacing you filter with a quality filter is smart. Skimping on the quality of filter will only cause more dust and dirt to clog your system. Installing a filter that is rated too high could restrict the airflow within your system and cause issues as well. You can find instructions for replacing your air filter in the owner’s manual for your HVAC system. When you go to the hardware store to find a replacement air filter, you’ll be faced with many choices. Bryant advises selecting a pleated filter with the MERV value between 7 and 10. Many filter makers also list the various contaminates that the filter will catch, such as dust, dust mites, dirt, particles from tobacco smoke, and pollen. If you feel your home needs additional air filtration contact a HVAC contractor for options that will improve the quality of your homes air. Cracks and leaks can develop in your ducts over time. If you haven’t checked your ducts in a long time, have them inspected (or inspect them yourself) for leaks. Look for gaps where two ducts connect and in the spot where the duct connects to the wall. Sealing ductwork with duct sealer or mastic (foil) tape reduces air leakage and is required on any new modified or replaced ductwork. If you’ve never worked with these materials before, have a contractor seal the ducts for you. Even if you’ve tested your HVAC system and believe that your air conditioner is in good condition, it’s still important to have a professional give your air conditioner a tune-up before the cooling season begins. Contact a professional in the Lincoln NE area for a routine checkup. Your technician can clean your unit, check its efficiency, look for damage, and make recommendations for repair if needed. If you have more questions about what you can do to get your HVAC system ready for spring, contact Bryant in Lincoln, NE. We’ll be happy to answer your questions!